The approach to the Mystery Island Banana Train was awe-inspiring. 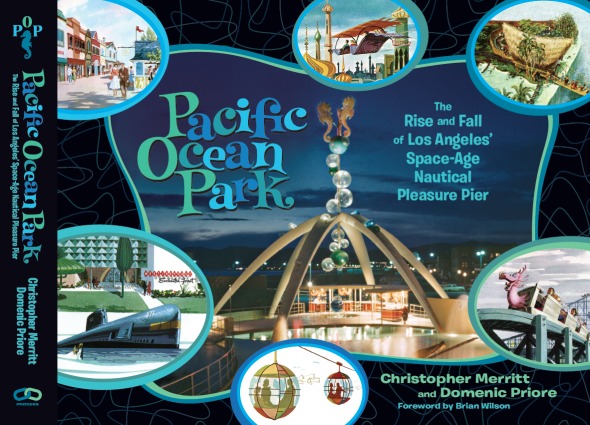 From the late 1950s to the late ‘60s, Angelenos looking for music, dancing and rides, found the party at Pacific Ocean Park. The beachside theme park – that jetted out into the Pacific – sat on 28 acres of land at the border of Santa Monica and Venice. It featured rides created by Hollywood set designers, setting it apart from the standard, ordinary rides at Santa Monica Pier. The two chronicled the park’s beginnings and endings – and its futuristic, cutting-edge design that made it so popular. They spoke to KCRW’s Steve Chiotakis. 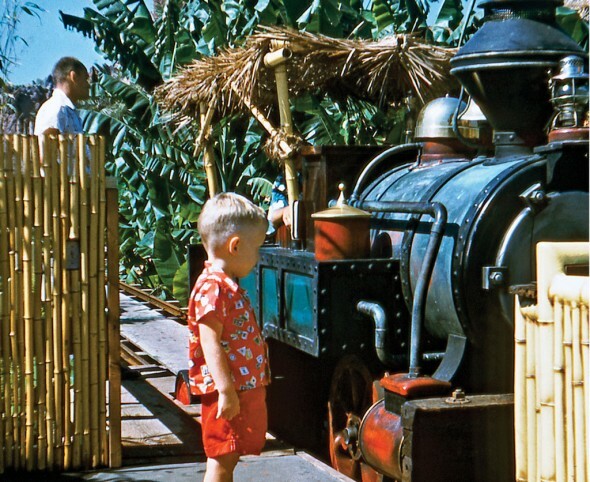 A young boy stares in awe at the Banana Train. 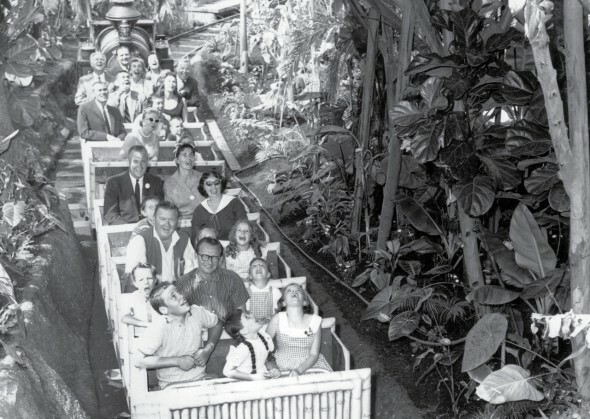 Manufactured by Arrow Development, it pushed rather than pulled the guests through the unique attraction. Pacific Ocean Park was also a place to see live music. The Aragon Ballroom – which had been around for decades – brought in bands from all over the world, from Frank Sinatra, to Harry Owens and his Royal Hawaiians, to Lawrence Welk, to later groups such as Pink Floyd, The Byrds and Janis Joplin. The musicians who performed at Pacific Ocean Park were reflective of the time, and of a changing America. Mr. Dolphin (later given the name Mahi-Mahi) was a simple oceanic redressing of the existing “Strat-O-Liner,” yet it continues to give the sensation of flying over the water once it got going. If Pacific Ocean Park’s history is of coastal development and competition, its postmortem is practically the same. The city of Santa Monica decided to redevelop the area. Beachfront condos replaced the bungalows across from the park. Streets leading to the park were closed, causing attendance to plummet. The city and the park’s creditors sued the park’s new owner to collect overdue rent and taxes. 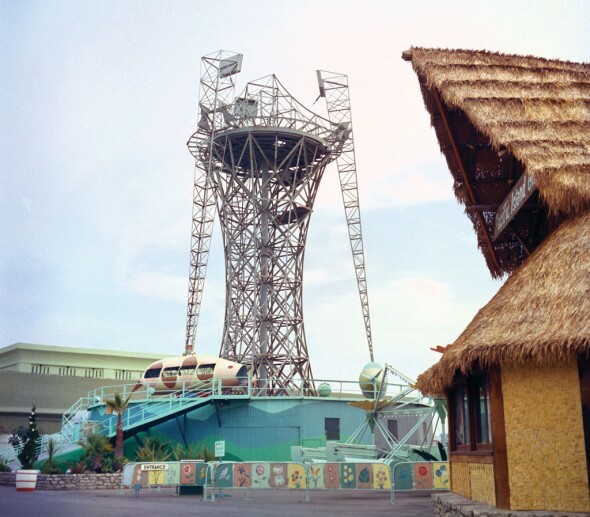 Pacific Ocean Park closed down for good in 1967, only nine years after it opened. And its afterlife turned hellish. Riders look up with riotous laughter at a cannibal menacing them from his hut above. 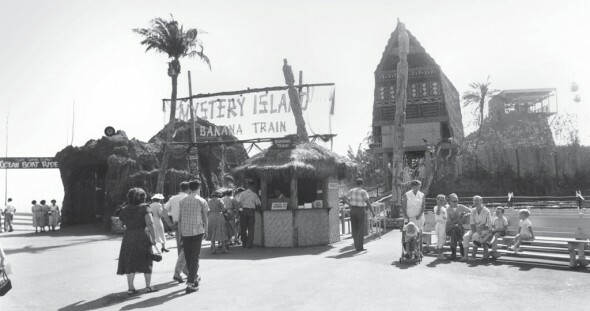 The Mystery Island Banana Train was a long, thrilling and engaging attraction through a jungle environment that fully embraced suspension of disbelief. 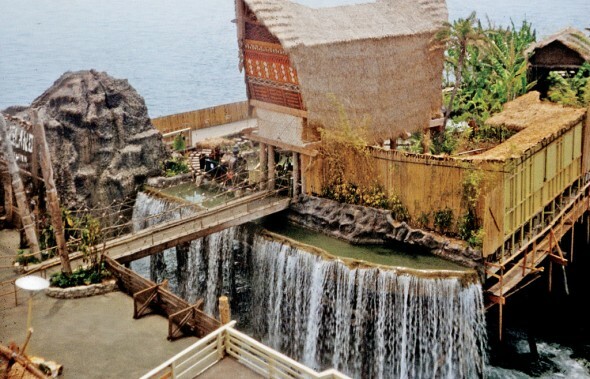 To begin the adventure, guests had to traverse a tiki-flanked suspended bridge over a waterfall pumping seawater up from the ocean below. Eventually what was left of the park was demolished completely. The condos are still there, overlooking a playground and a bike and walking path that meander the old footprint. The park however, is just a memory of a brighter time. 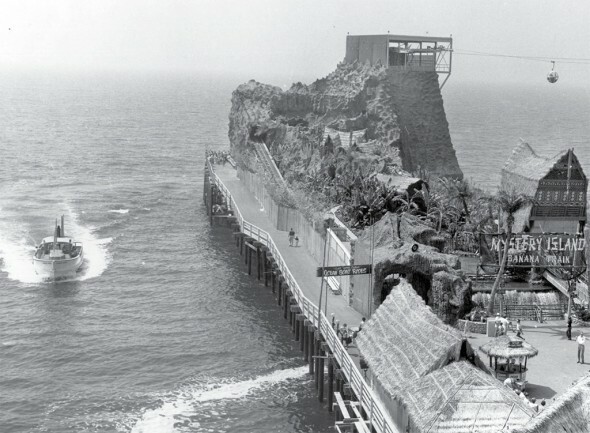 The culmination of a visit to Pacific Ocean Park was likely the first view of Mystery Island at the end of the pier.